Boca Raton is a naturally beautiful city in South Florida that boats fantastic beaches, events, high-end shopping and more. This city has it all for tourists and residents alike and offers some of the best cuisine in South Florida. It’s a retail paradise for large and small business across a variety of industries. Business owners in Boca Raton need cutting-edge security to protect their assets, properties, and customers. Making the smart investment in a state-of-the-art security system will offer peace of mind for years to come. Hi-Tech Security offers innovative security options and years of experience to clients of all sizes. We can customize most security packages to meet the specific needs of the business. This ability to create a tailored package helps your company experience the full benefits of our security systems. With the rapid advancement of security technology, many manufacturers offer innovative security systems with fully customizable options for any business. These options allow you to monitor your business from virtually anywhere by simply logging into an app on your favorite smart device. It’s also convenient to manage these systems since one can manage them remotely and feel connected to the day-to-day needs of their business. Our closed-circuit television (CCTV) cameras are a popular choice for business owners who are looking to purchase a top-notch security package for their companies. The reliability of these types of systems make protecting corporate property and assets makes them a favorite. Their base quality of 1080P, and their ability to integrate with Transfer Video (TVI) and Internet Protocol (IP) gives you an extensive choice of models that will satisfy your business needs. Hi-Tech Security has a variety of CCTV camera types to benefit your business. We offer many types of cameras that enable you to store and review your footage using a Digital Video Record (DVR) or a Network Video Recorder (NVR). Accessing these types of cameras is not only easy, but you don’t have to be onsite to do so. You can use your preferred smart device like a desktop, smartphone, or laptop. At Hi-Tech Security, we make every effort to ensure your security system is as convenient as possible to manage. Customers that do their research will discover that Hi-Tech Security has experience and knowledge that surpasses other companies. We have served the Boca Raton community for over 14 years and appreciate the overtly positive reviews we receive regarding our services and products. Our low-voltage contractors receive thorough training and must follow all the standards created by the National Electric Code (NEC). 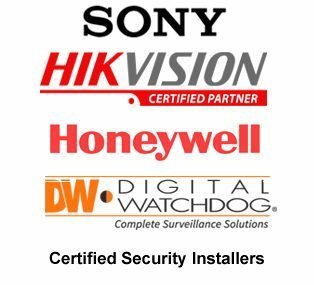 We offer lifetime technical support for our installations because we appreciate your business and the investment made in a reliable security package. Contact our Boca Raton installers today at (954) 394-2292 so we can give you a free consultation and quote.